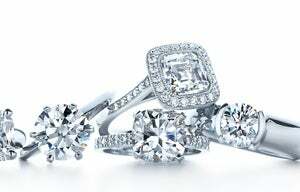 What does a diamond engagement ring mean to you? Love? Money? "Forever?" Over on Nerve, Ken Mondschein posits that diamond engagement rings are "profoundly anti-feminist." The idea that "only a diamond will do" is a relatively recent innovation, he explains. See, diamonds used to be so rare that only the very very wealthy could afford them. That is, until the 1870s. Diamond mines were "discovered" in South Africa, where, "poorly-paid, abominably treated native African workers" unearthed the gems by the ton. Cecil Rhodes, noted for having a famous scholarship named after him (and for believing that Anglo-Saxons are superior to others; he wanted the British Empire to rule every country and once wrote: "I contend that we are the finest race in the world and that the more of the world we inhabit the better it is for the human race") founded De Beers in 1880, and the diamond cartel became the most successful in the world. De Beers controls the supply of diamonds to keep them expensive, but, Mondschein asks, "How [did De Beers] convince the world that an isometric-hexoctahedral crystal lattice allotrope of carbon was something they absolutely needed to buy?" You already know the answer: Marketing. The slogan "a diamond is forever" debuted in 1947, giving consumers not only the idea that the diamond is a symbol of enduring love, but that it shouldn't be resold. This was because diamonds lose considerable value in resale, and since there's no point in paying De Beers full price when you could get a cheaper one second-hand, De Beers loses a lucrative sale on every diamond resold. Mondschien also claims that the subtext of a woman hinting that she wants diamonds — and even the right hand ring conceit — is "near-prostitution. "The marketing plays on a man's ego ("If you don't buy her a diamond, it implies, you not only don't love her, you can't afford her") as well as a woman's (you're supposed to think to yourself, I'm worth it). But, as with all complicated and deep-rooted traditions, the big question is: How do we break out of our diamond lust? De Beers has been accused of price-fixing and trading in conflict diamonds, but don't we all STILL look at the fingers of newly-engaged women and expect to see sparklers? How come we're all hanging on to the idea that diamonds are a girl's best friend?